Great scene of Minamoto no Yorimitsu (Raiko) and his men entertaining the demon Shuten-doji with wine and dancing. Shuten-doji had been kidnapping beauties and holding them hostage at his lair on Mt. Oe near Kyoto. 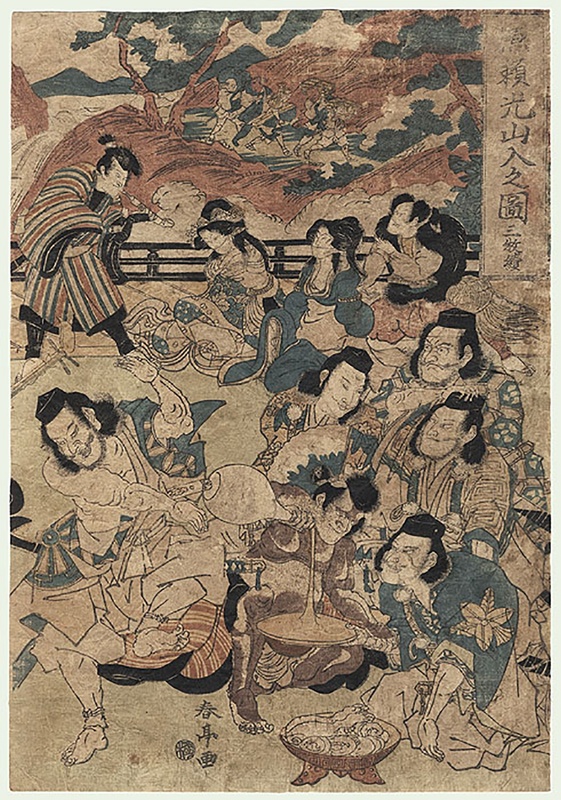 Disguised as yamabushi or mountain priests, Raiko and his retainers traveled to the demon’s hideout and plied him with sake until the creature was drunk, then killed him. Here, one man dances about, hopping on one foot and waving his hand while the demon pours an enormous cup of sake. Behind them, two beauties are bound and gagged. A lively illustration from this famous tale.